The 1963 March on Washington was a pivotal demonstration in the nation’s civil-rights history. It drew thousands of people to a peaceful protest of racial inequality and injustice. 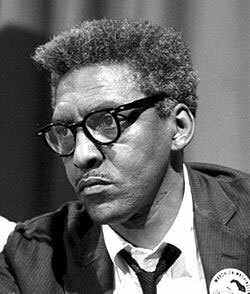 Its organizer was Bayard Rustin (1912-87). Openly gay in an era far different from today, Rustin took his place among the march leaders on the cover of Life magazine a week later. But his sexuality and other factors kept him from getting the recognition he deserved. In 2013, President Barack Obama awarded him the presidential medal of freedom posthumously, 50 years after the march. His eye for detail paid off. Rustin organized everything from food to restrooms. More than two and a half times the number he’d predicted — a quarter million people — marched peacefully that day. Rustin devoted six decades of his life to the fight for equality: for civil rights and gay rights through nonviolent protest. He had met Martin Luther King Jr. in the 1950s, and he started working with him as a strategist in 1955. But fellow leaders in the movement leaders took issue with his identity as a gay man. Rustin had been arrested on a morals charge in 1953. He’d been derided as a communist, a draft dodger and a gay man. Yet he persisted, and in his final years, he became more involved in the struggle for gay rights, his surviving partner, Walter Naegle, said.